How do established powers react to growing competitors? The United States currently faces a dilemma with regard to China and others over whether to embrace competition and thus substantial present-day costs or collaborate with its rivals to garner short-term gains while letting them become more powerful. This problem lends considerable urgency to the lessons to be learned from Over the Horizon. David M. Edelstein analyzes past rising powers in his search for answers that point the way forward for the United States as it strives to maintain control over its competitors. 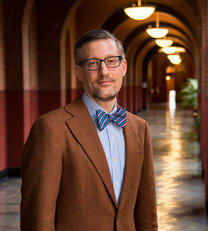 ​David M. Edelstein is an associate professor in the Edmund A. Walsh School of Foreign Service, the Center for Security Studies, and the Department of Government at Georgetown University. He is the author of ​Over the Horizon: Time, Uncertainty, and the Rise of Great Powers​ (Cornell University Press, 2017) and ​Occupational Hazards: Success and Failure in Military Occupations​ (Cornell University Press, 2008). He received his Ph.D. and M.A. from the University of Chicago and his B.A. from Colgate University.